JORDAN Hugill hasn’t ruled out returning to Hartlepool United next season after his goalscoring heroics kept the club in the Football League. But the on-loan striker insists his main focus is on breaking into the Preston North End team next year. I want to do what I can there, to help them in the Championship. The Middlesbrough-born hitman joined Pools in March and has netted twice in seven games, including the crucial winner against Exeter City - a result which kept the club in the Football League. Hugill has relished his time at Victoria Park, working under experienced manager Ronnie Moore. And while he would be open to returning to the Sky Bet League Two side for the 2015-16 season, he admits his intention is to work hard during the off season and force his way into the Preston side. The 22-year-old doesn’t lack confidence and he told Preston boss Simon Grayson before he moved to The Vic that he wants to be a big part of his plans next season, with the club on the verge of promotion to the Championship. “I wouldn’t rule out coming back but I would like to kick on at Preston,” Hugill told SportMail. “I want to take what has happened here - my successful time here - and take that confidence into pre-season this summer and hopefully Preston will get promoted. “Then I want to do what I can there, to help them in the Championship. “I said to Simon Grayson before I came here, ‘I am going to go out on loan, work my socks off and come back, work hard during the off season, get myself fitter and stronger and be part of your plans next year’. “I am straight up with everyone and I said I want to be a big part of his plans for next season. Hugill and strike partner Scott Fenwick both scored in the win over Exeter at a buoyant Victoria Park at the weekend, a result which secured the club’s future as a league team. 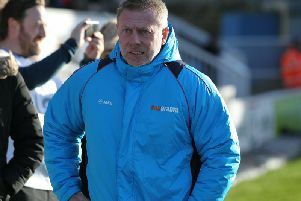 Pools had been 10 points adrift with just 11 games to go but managed to get out of trouble with one game to spare, the season finale at Carlisle United on Saturday. Both sides are safe from the drop zone ahead of the end of season dead rubber. Hugill added: “I can’t imagine how the other lads feel, those that have been here all season. “The main thing was to get to enjoy the last game, with no pressure on it. The Teessider played for Seaham Red Star, Consett, Whitby Town and Marske United before signing professionally with Port Vale in 2013. Hugill spent a season with the Vale Park outfit before being snapped up by Preston North End in June 2014.